PDF files are preferred. Contact us for other formats. Set up your art files in position to your printed press sheets. Use the same crops that are on the printed sheets. When exporting to PDF, use the High Quality job option. Please send us the UV separation only, in 100% black. High Quality PDFs are preferred, but we also accept EPS files. Vector artwork is best, but when creating masks from raster images, make sure it has crisp edges. In other words, each pixel must be either black or white, with no shades of gray. The artwork for Spot UV must be the same dimensions and imposition as your color print file, with the same crop marks and side guides that are printed on the sheets. Please do not include color bars. The artwork should have a white background, with the spot UV images in black. The CMYK value of the art should be C=0, M=0, Y=0, and K = 100. It is also acceptable to use a spot color for the UV. Applying UV Coating to an uncoated stock in theory should not be done. We have made it happen. The denser the sheet the better. A dense sheet can help retain the UV on the surface of the sheet. UV on uncoated stock is heavily influenced by the surface of the paper, which can give the coating a textured effect. For some projects, this effect can be desirable. Uncoated stocks have a "wire" side and a "felt" side of the press sheet. Experience has told us that each side of the sheet will UV coat with different results. Testing both sides of your sheet with ink and UV while job planning is strongly recommended. A delayed chemical reaction between the ink and coating can cause a color shift and possible "leaching" effect on the reverse side of the sheet. It is not always visible right off press, but can appear sometimes up to 30, 60, 90 days later. Pre-scheduling - Pre-schedule with our CSR as early as possible. Give us a heads up when you get the order. Under strict time crunches, moving a window of press time is easier than creating one at the last minute. Purchase Orders - We use your PO as our instructions. Please provide details. Information upfront prevents delays in production. Please feel free to use the “Quote Request/Job Order” form as a PO. Rule Ups - The more information the better. Although it may appear obvious, please provide a rule up and or a sample. Indicate gripper and guide. Give us position for taping, eyelets, grommets, spare outs, etc. so there are no questions and to ensure success for all of us. Overs - Avoid re-printing and a last minute scramble. Please provide enough overs, make ready, or running waste for our services and any additional finishing services after us! With all the different digital presses, toners, inks, fuser oils etc., out in the industry today, digital printing is not always 100% successful with coatings. If you haven't already, we strongly suggest testing your press sheets with a laminate or UV Coating prior to printing the live project. Digital printers will have "press bounce". When a job requires spot UV coating, consider designing a tolerance in your art work. Tight registration will be inconsistent from press sheet to press sheet. With variable data printing, print an identifying code on each press sheet that will allow us to confirm order of your sheets. Aqueous Coatings do inhibit the drying process. What seems to be dry on the surface may not be set underneath. We recommend you do not using Aqueous Coatings when film lamination is required. If you must Aqueous coat, please allow time for inks to dry with any finishing process. Creative Coatings will test press sheets prior to film laminating or UV coating for adhesion. Soft Touch Aqueous applied on1 or 2 sides of your press sheet in conjunction with Spot UV coating may cause a "ghosting" effect on the opposite side of your press sheet. 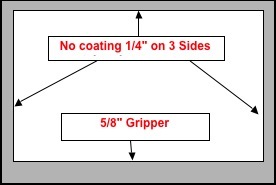 Minimum Sheet size is 11" x 17" up to 28" x 40 1/2"
Always provide a rule up and indicate gripper and guide. It is generally best to keep your press sheet in-tact to maintain gripper and guide integrity. Printing on thicker stocks will help prevent “show through”. We recommend a minimum 100# coated book. Scratch material should be applied only to coated stocks. In the design stages, print a image on the back of the sheet to help prevent show through. Multiple overprint colors are available. Projects with overprints should be printed on C1S stocks. 4 color process may be offset printed over our scratch material. When printing variable data and each sheet must be accounted for, we recommend printing a identifying code in the non-image which area. This will assist with replacing any spoiled sheets during production. Creative Coatings is experienced with high value scratch off projects. We have security processes and procedures in place, including cameras that are located in all production areas.